Interview with Victoria Sinitsina and Nikita Katsalapov. Five years ago in Saitama news appeared that you were planning skate together, and now, again in Saitama, you won the silver medal of the World Championships for the first time in your career. How was this path? Victoria: It seems to me that these 5 years passed very quickly, because they were so intense, so many ups and downs … I can say that Nikita and I have grown up over these 5 years, matured morally, gained wisdom and experience. This path was difficult, but pleasant. Nikita: Just today I realized that in Saitama the circle was completed for us. This is great, and now our story seems to be starting anew. This World Championships have become a new starting point. Vika and I are very proud that, in spite of everything, we have overcome all difficulties. We had to go through a lot in these 5 years. But I don’t agree that these years passed quickly. To some extent yes. But on the other hand, these 5 years have been long, different, and so much has happened to us as it hasn’t happened to me in my entire life. Therefore, we are glad that we found our own door, opened it, saw the corridor and I hope, or rather, we know that we are on the right way and we know where it leads. We are happy with this season, although there is still a World Team Trophy ahead. In general, despite the mistake at the European Championships in Minsk, we coped. It was your only failure in the season. Nikita: Of course, we wanted to place higher at the European Championships. And we could. We were very well prepared and really wanted that. But we have already talked about this topic with you – a ridiculous mistake, like I was “shot down”. There is no excuse for this. What happened, happened. The main thing is that at the World Championships we had such a good closure. How did you prepare for the World Championships after competitions in Minsk? Nikita: At the World Championships, we had different thoughts before the short program. Then, in Minsk, I was determined to win, win, go ahead, fight! And in Saitama, I thought that I had already skated this short and free program so many times, and here it is – this moment, perhaps, the final (I don’t like the word “last”) performance of this season. This wasn’t like at Europeans, where I had thoughts that I have time, I will improve … No, at Worlds I thought that I had prepared everything and went to the ice with confidence. And the ice in Saitama is stunning, which holds any edge. We flew to Japan a little later, we didn’t have a chance to try the ice at the main arena, but the guys, the Americans, Canadians, everyone said that the ice at the main rink was made with soul. And at the warm-up before the short dance, we realized that this ice allows you to do everything. It reassured us even more. We understood that we would do as we agreed, we will show everything that we have prepared. And nothing more was needed. We were doing and showing what we have prepared. That’s all! I don’t know, maybe you are right, in Minsk, I rushed off somewhere. And at the World Championships we managed to show everything. What thoughts did you have after the free program? Victoria: I was glad that we finished this competitions, that we had passed it without mistakes and performances were good. I exhaled on the last pose and was very happy. At that moment I didn’t know the scores, I was just happy that we did it, that there was satisfaction from the work we had done before the Worlds, that we did it all. And when we were sitting in the “kiss and cry” and saw the scores, of course, emotions come over. Nikita: We really hoped that we would be in the top three. Victoria: There were very small gaps between five or even more pairs. Any mistake could have changed the results, so we didn’t have a right to make a mistake, and we were glad that we didn’t. 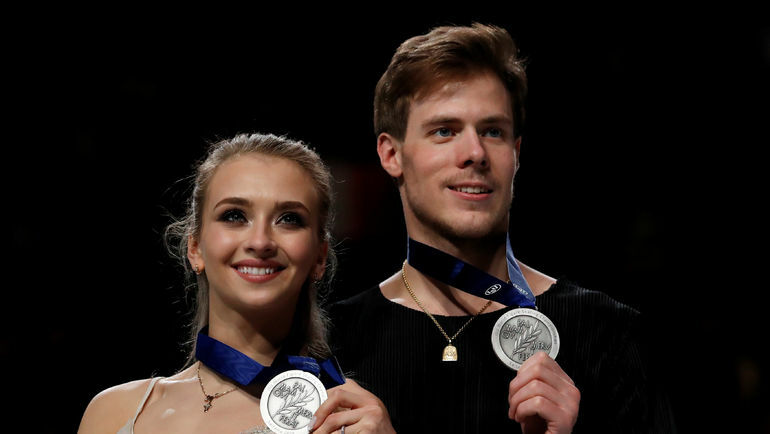 Now in ice dance, top-level pairs are close to each other; at the World Championships in Saitama, almost all the leading duets received level four for the elements in the free dance. How to deal with such a pressure? Nikita: You don’t need to think about it, because if you think about it all the time, you can overthink and knock yourself down. It is necessary to be distracted, because the very thought “not to make a mistake, not to make a mistake” can mess you up. After the rhythm dance, we set ourselves that there would be a new day, a new program and we were concentrated only on it. Yes, maybe someone thinks about the scores, counts points, someone likes to watch the opponents’ performance, this motivates them. But not us. Vika and I, before the free dance, distracted from everything – looked at the floor, at each other, at the coaches, again at the floor. Came on the ice and there were only us, only music and the audience. Victoria: Even when Sasha and Vanya were skating right before us, I didn’t hear their music or their scores when they were announced. I was so deep in myself that I didn’t notice anything that was happening around … For me, the most important thing is to begin a competitions. This is really the most difficult. Go to the ice, take the first step. After the short program, everything is much easier. This season you have very successful programs, especially the free dance. We can say that you hit with the program, because you skate it with your soul? Nikita: We also hit with Rachmaninoff, but we did not finish it. This season both programs were successful. But I do not like the word “hit”. It was Sasha’s (coach Alexander Zhulin – ed.) idea. A very clear one why we should take this music, not just let’s try it. Victoria: He was sure about the the music and the program. Nikita: Everything was thought out in advance, so that I would not rush, but feel calm, confident, so that we would show every gesture, every arm, every transition and at the same time element would flow into the next element. And how was it? Zhulin came with music, idea and a clear plan? Nikita: And we started to work. This is generally my favorite time, the most favorite moments when we start creating. I love to participate in it. Just adore it. And I was lucky with my partner, because after 5 years Vika and I learned to understand each other without words. I used to take her hand, and she kept asking: “What are we doing, where are we going?” And now I take her hand and I’m surprised: how does she know what we are going to do? And she does what I really intended. Next season will you change your style or do you think you have found your own? Nikita: Alexander Zhulin has offered us already three different versions of music. It was before the World Championships. So there are already three ideas. The World Championship has passed, Vika and I will be able to listen to these options more attentively, on the plane on our way back. Vika has already started to listen. Honestly, I didn’t distract myself at the World Championships with this thoughts. I try not to run ahead. I can’t do that. I have to move gradually, step by step.